A manufacturer in Westland has developed a product to compete with century-old materials. 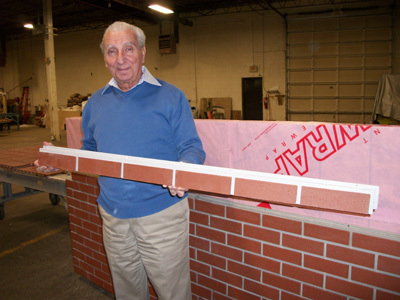 A self-described innovator and efficiency expert, Constantin Bodea spent the last four years refining and testing an interlocking system of polymer brick panels that can be installed by contractors and do-it-yourselfers alike. The product, priced at roughly half the cost of conventional brick installations, is starting to roll off an assembly line in Westland. The system, called Poly Brick, offers several benefits over traditional bricks and mortar. Impervious to water, the product can withstand high humidity, saltwater, and rapid temperature changes. The brick panels can be installed in hours using a drill, saw, and level. By comparison, it takes two or three days to set brick and mortar, factoring in curing time and a chemical wash.
Bodea says Poly Brick was a natural extension of his main business of producing precast polymer concrete panels and steel substructures for use on hospitals, office buildings, schools, and churches. The large panels duplicate the appearance and longevity of granite or limestone, while offering significant cost savings. A three-year slowdown in construction, a result of the 2008 national economic recession, has helped boost sales, Bodea says. The company operates from a 32,000-square-foot factory — one of only a handful of polymer panel production facilities. Close to home, Metro Cast panels were used to reface a series of century-old buildings lining Woodward Avenue in downtown Detroit. The renovation effort, called The Lofts of Merchants Row, offers 147 apartments in the former home of the S.S. Kresge, Woolworth, and Seder department stores.